For centuries, the warrior-state of Rajasthan successfully resisted the rule of my ancestors, the Mughal kings. Rajasthani’s were fearsome fighters, a proud people who even taught their females to fight, something unknown among Indians. Now Rajasthan has successfully fought and won India ’s newest and biggest sporting battle, defeating the Chennai Super Kings by 3 wickets. Strangely enough, Rajasthan’s general was none other than Australian cricketing legend Shane Warne. Rajasthan batted second, chasing a total of 163. They needed a run-rate of over 8 per over. In 1-day cricket terms, a run rate of 6 per over would be deemed near impossible. But in twenty-20 cricket, such high run rates are quite normal. Also quite normal are batsmen who hit more sixes than fours. Rajasthan’s star batsman, Yusuf Pathan, hit 4 sixes and 4 fours and reached a total of 56 in 39 balls. Pathan’s partnership with Shane Watson yielded 65 runs in just 45 balls. Ironically, the winning runs were hit by Sohail Tanveer, who at international level plays for India ’s arch cricketing rival Pakistan . Rajasthan’s captain, our very own legend Shane Warne, was also batting at the time. Warnie will get to hold up the diamond-and-ruby-studded IPL trophy. As Rajasthan’s captain, Warne has now become an Indian hero. No doubt Bollywood will make him a few movie offers. I can imagine him performing some hot Bollywood dance moves or punching villains despite his swinging fist being 1 metre or so away from anyone’s face. I predict Twenty-20 will have an impact on the 1-day game. Batsmen will be less reluctant to hit sixes. Batting teams will score runs much faster. A final score of 350 for the side opening the batting will often no longer be a winning score. Will English county cricket teams still attract top overseas players? I doubt it. The IPL tournament will become the tournament of choice for players seeking overseas experience and a fast buck. Alleged monkey Andrew Symonds managed to pick up a cool $1.47 million. No doubt he’ll feel like the monkey-god with that sort of money. And I’d happily change my surname to Pathan if it meant securing US$925,000 from the Kings XI Punjab financiers. This sounds like good fun. 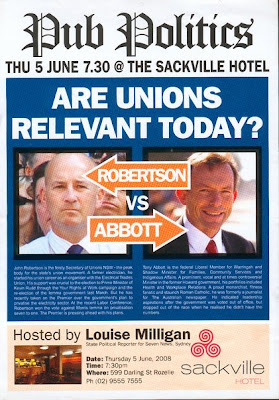 My bet is it'll be better than watching a boxing match between Abbott and Manne.